Having cats at home requires you to pay more attention to your living environment. Cats are not really messy pets but they do leave trails of fur everywhere they go. When accumulated, these fur balls turn into dust bunnies, which need to be cleaned and removed on a regular basis to ensure a fresh, clean breathing environment at home. That's why I recently started using an air-purifier to help remove air toxins and dust particles from the air we breathe. I'm also thinking of getting a Blomus Stainless Steel Humidifier for our home. I hear that it's good for sinus problems, which I suffer from. Having cats isn't exactly recommended for my sinus problem since fur could easily trigger an attack but I love my cats too much to not have them around. So a humidifier will help me manage my sinus problem better, ensuring both Master and cats are happy! If you're looking for a humidifier as well, stop by The Stainless Steel Store. Shopping here promises you an enjoyable experience. The store takes great emphasis on creating special products for everyday life. They believe that design is expressed in things we use daily, and in accessories and decorative items surrounding us. Great care is taken to ensure the creation of home decorations and accessories that combine simplicity of function with the beauty of premium materials. 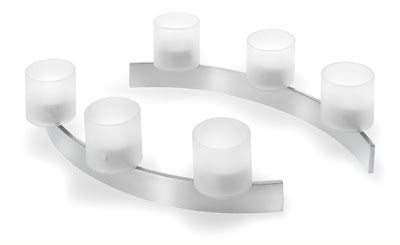 I found several great items here that I'm itching to buy like a beautiful Blomus stainless steel teaset and this Blomus stainless steel tealight holders. I've been using a lot of scented candles lately and this candle holder is lovely don't you think? Gosh.. wah memang sesuai ni topik entri kali ni. Berkaitan sungguh. Monica! I still haven finished dropping for WOAFS la wei! Hahahah! Eh Rizal, sat lagi ur kursus hahahah, have fun! Marzie, dulu rizal ada juga beli pembersih udara, masa ada anak kucing. Bagusnya, bayangkan ada poopoo sampai dua tempat dalam bilik, tapi masa pergi kerja pasang, balik kerja petang memang tak bau langsung bila tu. Udara pun segar. hahahahh I don't think i can drop 300 lah today!! how abt MPG and Meows? 600 edi? Tgh survey2 Air purifier. Rasanya kalau beli baik beli Air Purifier dari Air humidifier kot. Macam bahasa pembersih udara ni siap dengan air ionizer arr apa la..
Senang yang kalau tak perlu tukar2 filter ni. Jenama famous medklinn, tapi ... yang rizal sibuk nak yang ni..
krystalAir, sebab nak guna kat bilik jer. Dalam rm380, tapi tuu laa nak raya ni nak beli kuih raya, jadi sementara tuu beli laa yang cikai spray cit cit cit cam ambi pure tuuu dengan pemati odor dan penaik bau. Hahaha..
Tapi bulan ramadhan kena bersabar dan berfikiran baik.. Amin.. I agree, Rizal is so funny! Morning Meow 1! I seriously dunno what time Im gonna zzz la today hoho! MPG only 300, meows about 70 and WOAFS 250… heheh not that bad right??? LOL @ I don have meows at home!! U balik kampong ke Rizal? Bagus, bulan Ramadan baik bersabar lebih, jgn throw tantrum kat client macam I hohoho!!! hahahhaaha better than me lah...5 only! LOL!! LOL @ Uda + Dara! He he takda la bling2, but lime green tu wajib! I’m working on my translasi now Mon…. then only drop.. Dropped 300 for WOAFS edi, now working on meows! Thanks for chopping peeps, have a great day! Not yet Bill, I have an urgent job to do for my client.. huhuhu! I chopped edi Bill yeeeha! Stopping in for a quick Meow... Say hi to your kitties for me! I'd be too afraid the cats would knock the tea lights down. They like to jump and see if they can reach high places.